I came across Calimer`s Wheel Shop and I was wondering if anyone knows anything about them? They are in PA. I see Calimer's work at Hershey every year, and it looks good. But I've never used any of his wheels, so I can't testify about how well they work. I have some Stutzman wheels, and they're excellent. But I suspect all the wheel shops do good work. Bill Calimer is a third generation wheelwright. Bill, like his father and grandfather before him has a lot of experience with building and restoring antique automobile wheels for a variety of makes - not just Model T wheels. He does high quality work. Both Bill and his father did some work for my father - a set of wheels for his 1900 Waverley Electric. Two of the wheels required completely new felloes and some spoke replacement. The rims were tightened (I believe they cut out a very small section and re-welded the rims in order to reduce the circumference) and installed hard rubber tires. Below is one of the wheels that required a brand new felloe and some spoke replacement (there was some wood rot from the car sitting in a shed with the wheels in the dirt). 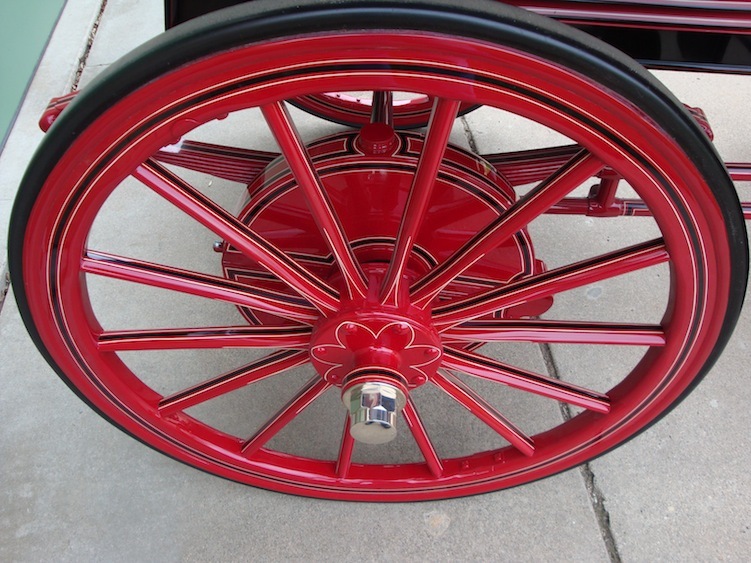 Calimer staggered the new spokes with the original spokes so the wheel would run true. He also tightened the rim and installed the hard rubber tire. I have a set of Calimer's on m y '14. Very high quality work; very happy with them. Still looking good after 15 years. The only thing is, he's very busy; I was 6 months getting mine back, which wasn't a problem for me then, at that stage of the restoration. Calimer did the wheels for my '10 Chalmers Detroit and a set for one of my T's several years ago. Great job and I was able to pick up the finished product at Hershey. I too was in no rush so I dropped them off at Hershey one year and retrieved them there the following year. Bill Calimer did a set of wheels for my 27T. I was very satisfied with the result and the service. Dropped the wheels off at Hershey in Oct. and picked them up at Bills shop in Jan on my way to FL. Bill Calimer did a set of wheels for my ‘23 Touring. Like many have said here, his work is excellent. He has a spoke duplicating lathe and he had hundreds of patterns from the wheels that he’s done. Really obscure stuff too. He doesn’t just do Model T wheels. I do recall waiting several months to get them done. At least at that time, he was a one man shop. So I never got the feeling like I was being ignored, rather, that he’s just constantly busy. He was always nice enough to take a break from his work and answer the phone when I checked in a couple times. I too have had great work done by Calimer. If you want to do the optional natural finish, for a small extra charge he will color match the spokes. I had im do the wheels for my 1926. I am another Calimer customer. My 1912 Buick wheels took almost a year, and would have taken longer, but he pushed them through at the end so I could make a tour. Excellent craftsman, very nice guy. Gave me a tour of his shop and recommended the best fish sandwich in town! It looked to me like he does T wheel parts as regular production items, so the wait may not be too long for our Fords.